You destroy darkness by light. Light in form of knowledge is capable of destroying the darkness of ignorance. By doing so we can surmount all the difficulties and become successful in all our endeavors. The night is propitious because it gives all peace and relaxation. The night helps us to relax so that we become fresh and energetic to perform the next day's duties. In this way the night is beneficial to one and all. 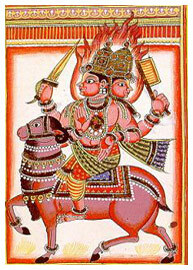 The intellect of the Agni God is pure and auspicious for all. The person who strives selflessly for society automatically is respected and honoured. That is why we should engage in those deeds by which the entire society benefits. By doing so our mind and heart shall become pure and propitious. The ultimate aim of Agni is social welfare and the ultimate aim of every human being should be the same. O Gods! May I never speak anything harsh. We should always abstain from inauspicious and harsh words that inflict pain. Pain inflicted can not be taken back. Physical injury is sooner forgotten than insults and harsh words. The effect of good words is always good and in the long run it reaps good benefits. May I be always blessed with success. Man can only be successful if he engages in work performed for the benefit of all. By doing he shall earns a lot of respect and honour. Success and fortune always bless such people. The lord is always capable. The person who controls all his senses is always capable. Every person should strive in order to have his skills and capabilities because the person who does so can only become the master. We can make the body capable by exercising regularly and can make the mind capable by practicing concentration and keeping the mind stable and calm. We can acquire maximum knowledge by self-study and by reading sublime literature. When we become capable in all ways we can become masters and as a result we shall be respected wherever we go. The yagya enlightens the mind. During the Yagya the samaveda is recited as a result of which the mind becomes stable and calm. Simultaneously the atmosphere also becomes pure and devoid of pollution. Consequently the atmosphere and the samagana enlighten the mind and facilitate spiritual progress. Soma infuses in us the enthusiasm to win. The Vedas speak of the soma in some places. Some scholar believer it is synonymous to `Bhang'. It is mentioned that Lord Indra's favourite drink is the Soma Rasa. Soma infuses energy in each and every part of the body and improves blood circulation. As a result the body becomes energetic. It ushers enthusiasm and helps us to accomplish all our duties tirelessly. A person who is truthful is always soft spoken. The truthful person is never indignant and harsh. He is devoid of fear, which is why he speaks sweetly to one and all. The Gods do not favour the lazy and indolent. The person who is lazy can never become a scholar. Laziness erodes a person's enthusiasm and energy. As a result the person loses all opportunities and finally becomes dejected and frustrated. Moreover he stops believing in the fact that he can ever succeed. The Gods favour the diligent and industrious. One cannot achieve anything in life without engaging in action. A person who is diligent and consistently engaged in good actions shall attain all his goals and become successful in all his pursuits. So it is in the best interest to take part in the Karma Yoga and fulfill it to the best of ones abilities. Do not stay in the company of those who abhor knowledge. The people who abhor knowledge always dwell in ignorance. Good company can make a man and bad company can ruin a man. During the rains, the drop of water falls in and loses its existence and on the contrary the drop of water falls in conch and assumes the form of a pearl. That is why people who desire knowledge should refrain from people who believe that ignorance is bliss. One should not listen to anything bad. One should not listen and speak anything bad. By listening to bad things and contemplating on them, the person can engage in bad deeds. That is why one should refrain from listening to anything that is bad and negative. Always engage in all good deeds. One shall reap fruits on basic if the actions performed. Good deeds shall undoubtedly sooner or later fetch good fruits. People who engage in good deeds are always praised and respected. People who do so shall are blessed with all the desired things. Therefore it is imperative that one should thoroughly abstain from bad actions. You are always engaged in a war. Life is full of strife and turmoil. It is in therefore in the best interest of one and all to take part in the war without desiring anything. A life devoid of strife is a life devoid of happiness and realization. One realizes the significance of happiness only after pain. Therefore our aim should be to be take part in war and strive selflessly to be victorious. After realizing the truth do not become indolent. The person who strives and attain the most divine form of knowledge should never while away his time. He should engage in performing great deeds. Knowledge leads to light and light leads us on the path of success and progress. We should therefore attain knowledge of the self and think of the welfare of others. Lethargy leads to failure therefore one should abhor it vehemently. The scholar achieves the ultimate goal on the basis of his abilities and its proper usage. Knowledge destroys ignorance. The scholar assimilates all the means required to fulfill a particular task on basis of his intellect and eventually becomes successful in achieving it. Because of this he becomes noble and great. Fire enkindles fire . It is fire that eliminates and destroys darkness. One karmayogi can be successful in creating another karmagyogi. In this way one is successful in enlightening the other. That is the reason why the company of scholars is preferred and is considered very auspicious. Knowledge perpetrates knowledge and ignorance perpetrates ignorance. That is why we should ourselves engage in good deeds and encourage others to engage in the same. The person who is truthful does all their deeds by treading on the righteous path. Truth is the instrument to engage in good deeds. The truthful is always ready to do good work. The greatness of truth is indecipherable, that is why it is mightier than anything in this world. Improve your speech and speak only the truth. One should always speak softly and distinctly. Audience is always attracted towards those who are fluent and speak good things. Make us capable enough to engage in good actions. A person who is constantly engaged in good actions is never plagued by the dilemma of good and bad thoughts. By incessantly engaging in such actions he become capable and adroit in his work. Incessant practice makes a man perfect and his deeds reap rich dividends. If a scholar is radiant i.e. an expert then he is respectable. A distinguished person achieves name and fame only because of his adroitness and assiduity. People worship such noble souls because of their merits and qualities. That is why such scholars hold a respectable and honorable position in society. Scholars, your deeds have disseminated all over the society. The radiance of knowledge provides everything. Similarly the greatness of great deeds also is all-pervasive. The actions performed by great souls to spread knowledge, promote knowledge and disseminate to every strata of society. The greatness of the heroic deeds performed by the valiant and courageous spread everywhere. One becomes successful by engaging in noble deeds. As a result such a person also becomes prosperous and affluent. Such a person who attains knowledge does not need amenities of comforts, on the contrary he become mentally and physically strong. The courageous augments their success by their hard work performed selflessly and as a result reap benefits. A person becomes pure by engaging in religious activities. O Creator! Fill the heaven and the earth with your divine radiance. The sunrise brings light to the entire world. Similarly the humans are praying to soma so as to make them radiant as the sun and bless them with all the good qualities. Bless all the animate and inanimate objects with knowledge and effulgence. O intelligent Vayu (Wind)! Come here embellished with all the merits. The wind is always active, agile, and that is why it is said that shun lethargy and become assiduous. Become swift and efficient. Inactivity is the root cause of failure. The ultimate aim of human life is incessant fulfillment of one's duties so that it accrues in the welfare of all. The person who engages in the good of other on the basis of his intellect, becomes successful and progresses rapidly on basis of his capabilities. This fact is self-proven that a person who engages in doing good to others, himself become successful. When such people do work they accomplish the Jnana Yagya and pave the way of knowledge for one and all.